Here’s how your agency can create its best case study by practicing digital marketing on itself! The sales team is the heart of most companies. The entire organization relies on them to make a sale and keep growing revenue. Of course, they also need the marketing team (they sometimes don’t know it). Each of these departments feed on each other’s success, or at least they should. Different teams have their own individual responsibilities to contribute to the organization’s goals. It is crucial for these teams to not only align their goals, but also their day-to-day activities. At GROU, I have come to realize that it is very difficult to bring sales and marketing together if each side doesn’t understand what the other is doing. Having technology for the teams to seamlessly communicate is vital for a proper partnership. Marketing handles much of the customer journey towards the final sale. It provides leverage for the sales rep, even moreso with the modern buyer who seeks out all of the information before talking to the rep. Marketing needs to be an insider in that sales process in order to make adjustments and prove the ROI of their ongoing efforts. We know these teams need to be working together, but, there is one other team that needs to be considered in the puzzle… account development (or the implementation team). We talk so much about having marketing and sales work together that we forget about the last crucial piece. Account development needs to be included especially if you are an Inbound Marketing agency. How will your sales team be able to sell something if your agency is not the best at doing it for yourselves? The sales team has to care about this. If your agency is not the best at what you are selling, you are simply impairing the sales rep’s job. It’s interesting to me, as a member of an agency, to watch as we consider sacrificing the time for our own marketing efforts in order to fulfill our promise for our customers! This has proven to be counterproductive for us over and over again. Why? Because customers and prospects will judge us on our own marketing! Think about the ways that people evaluate software… is it best-in-class? Does it perform well in all of the areas I need it to perform? Being a service-offering agency doesn’t save you from an evaluation process. Don’t you think that being able to showcase your own inbound marketing efforts is the greatest sales pitch? How could I sell SEO, Content Development, digital strategy, etc. to someone, if I haven’t built enough credibility to even do it for myself? One of the biggest lessons I’ve learned this year is that we have to stop assuming that providing results for our customers is enough. We have to position ourselves as our very best case study. This will not only build a statement for future and current customers, but will provide us with leverage for our sales team. 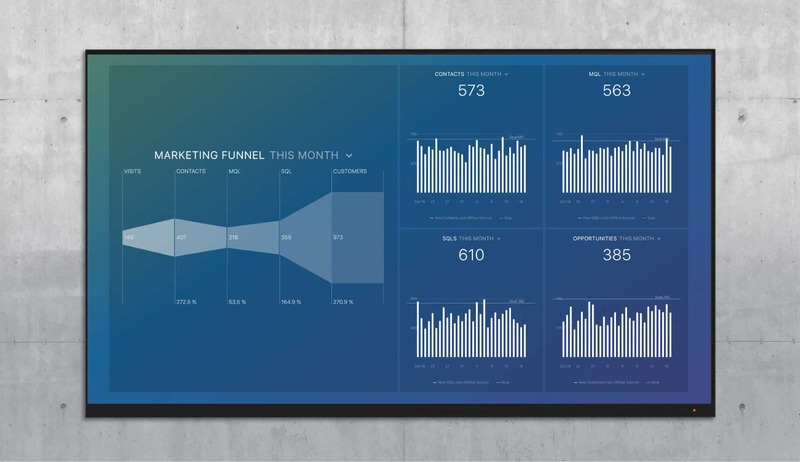 We are currently involving our sales reps in the monitoring of our dashboards, and not only sales dashboards, but marketing dashboards too. This has given the sales team transparency into what our marketing team is doing to help them, and what our development team is doing for them to be in sync. 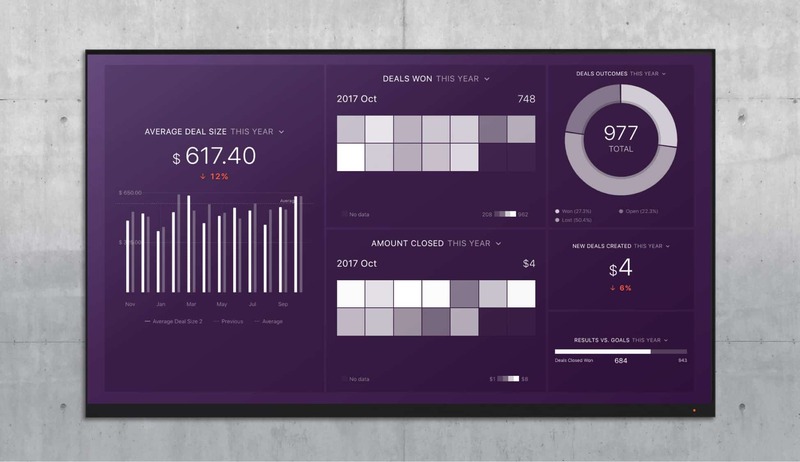 The first dashboard that sales needs to be familiar with is, of course, the Sales KPIs dashboard. This will indicate their own performance towards their own goals and the organization’s overall goals. *Additional tip: Having Marketing access this dashboard can make them push harder toward the end goal: the sale. This Databoard will help sales track whether they are receiving the number of leads established in the SLA (Service Level Agreement) alongside marketing and development. They should be aware of the goals that marketing and development have set in order for them to keep closing. This includes the amount of website traffic, conversion rates from visits-to-leads, leads-to-MQLs, and MQLs-to-SQLs. Sales needs to understand why they receive more leads during certain months, and why some months seem to yield more leads from certain industries. They need to understand because they are selling the exact same marketing services to customers! They need to be able to use a consultative sale approach, assess the quality of the customer’s leads, and learn from the agency’s decisions. It’s crucial for our prospects to know that we are willing to use inbound tactics to grow our own business. We want to show that we believe in it and that we are good at it! Finally the most important dashboard for the organization: the Lifetime Value to Customer Acquisition Cost Ratio. This is a crucial indicator of the organization’s health as a whole and, if you are an agency leader, you should know it by memory. This should be the dashboard you put up on your wall, you add to your daily scorecard and you view every single day. This dashboard provides transparency into the organization’s conditions. It lets the whole team know if we are healthy or need improvement. you should closely monitor the trend for periods of time when the ratio is better than others. This will also show you when you have a positive ROI on marketing and sales. Customer Lifetime Value (LTV) is how long the average customer sticks around before they leave you. You can calculate your LTV by calculating your average ticket sale or average retainer value with the average time (months for example) your past customers have stayed with you. For example, let’s say you normally sell $1,000 monthly retainers and your average customer stays for a period of 8 months. Your LTV would be: $1,000 * (8) = $8,000. So you would say that on average a customer in their lifetime with you would result in $8,000 of income. It is important to note there are different formulas for calculating your LTV it depends on your type of industry. Cost of Customer Acquisition is how much you spend acquiring a customer. You can divide your entire sales and marketing budget by the number of customers you acquire over the same period of time. In order for you to calculate CAC, you need your total marketing spend in a year. Let’s say it’s $20,000 and your sales expense is $28,000. You would additionally need to know the total customers acquired in that period (annually), suppose it is 24. Then you add the total marketing and sales expenses and divided by the number of new customers acquired in that period of time. In this example, your cost to acquire a new customer would be of $2,000. With those two metrics, you can then calculate the ratio, in other terms, the ROI. The ratio (LTV:CAC) would be 4:1. Should I invest more in my business? Should I go slower or faster? Do not use this only to make sure your business is profitable. Your LTV and CAC can always change over time. Try building this dashboard by using Zapier or connecting your CRM or your accounting software. We built ours with the Databox Google Sheets integration where we placed the metrics in a monthly timeframe and then visualized which months are healthier than others. To connect this sheet with Databox, you are going to use Zapier. Here are instructions on how to integrate the two. Note: This Google Sheet is only a starting point for you to create the Databoard. The trick is to calculate these metrics on an ongoing monthly basis. You can copy this template to your account. A good and healthy ratio is 3:1 or higher. If you have something higher than that you have a great business model! Consider investing more in your business to maintain this growth. When everyone in the organization shares the same goals, your team can be synchronized and working together towards shared victories. 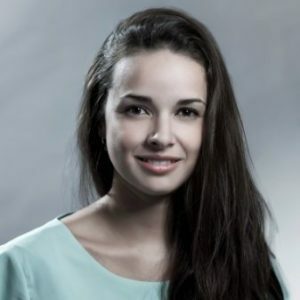 Martha Madero Gonzalez Martha is the innovation director at GROU. She works with clients on using information technology to reach their business objectives or overcome problems.